399 pages | 176 B/W Illus. An accessible primer, Electronic Health Record: A Systems Analysis of the Medications Domain introduces the tools and methodology of Structured Systems Analysis as well as the nuances of the Medications domain. The first part of the book provides a top-down decomposition along two main paths: data in motion—workflows, processes, activities, and tasks in parallel to the analysis of data at rest—database structures, conceptual, logical models, and entities relationship diagrams. Structured systems analysis methodology and tools are applied to: electronic prescription, computerized physician order entry, drug dispensation, medication administration, and clinical decision support. Assuming no previous clinical and/or informatics knowledge, the book supplies a comprehensive view of the EHR/EMR with dedicated chapters on: user interface considerations, reporting requirements, and standards and vocabularies for meaningful use. Containing clear language and more than 170 figures and 100 review questions with answers—this book is a great companion for Healthcare IT professionals and an ideal resource for clinical informatics students. … a common sense guide to this new world of informatics … should prove invaluable to the clinician making his/her way past the commercial hype into the realm of true understanding of the systems of medical informatics. … strongly recommended … . Finally, here’s a textbook that the market and the industry have been looking for. The author has captured the details of the information flows involved in the EHR while processing an order or prescription from inception to completion. … a thoughtful and well-constructed manual to understanding and incorporating the complex and many-sided aspects of medication concepts … a clear and accessible entry to this challenging topic. … encompasses high-value, high-volume therapeutic transactions of indescribable complexity that touch nearly every licensed professional in a hospital … I’m hoping the vendors of my own hospital’s systems take its recommendations to heart. …. a very useful guide … provides the necessary detail that is often missing in many books… very useful in health informatics education at universities and courses within community colleges. … a welcome and valuable addition to the toolkit for IT professionals and clinicians participating in the design or implementation of EHR systems. Finally, here’s a textbook that the market and the industry have been looking for. The author has captured the details of the information flows involved in the EHR while processing an order or prescription from inception to completion. The book should help any clinician or informatics professional understand what’s happening in the process of medication order, dispense, and administer. … encompasses high-value, high-volume therapeutic transactions of indescribable complexity that touch nearly every licensed professional in a hospital, enrobing drug ordering, dispensing, and administration in sophisticated layers of clinical decision support, caregiver work lists, and back-end charging and continuum of care functions. I am pleased that the topic merits its own formal review and analysis in Dr. Scarlat’s book. I found the user interface chapter immediately useful – in fact, I’m hoping the vendors of my own hospital’s systems take its recommendations to heart. The informatics transformation of American Healthcare as a result of the American Recovery and Reinvestment Act (ARRA) Meaningful Use (MU) program is now truly underway, creating an entirely new language and dimension to the practice of medicine. As physicians (and other clinicians) move through MU, past the stage of commercial technology acquisition and implementation, the need for a deeper understanding of the structure AND function of these new knowledge systems is not only necessary but essential. Dr. Scarlat’s comprehensive and logically structured handbook acts as a common sense guide to this new world of informatics that should prove invaluable to the clinician making his/her way past the commercial hype into the realm of true understanding of the systems of medical informatics. Well referenced and comprehensive, this work is strongly recommended to the new meaningful user as well as those that work with and support clinicians in this essential next generation of American Medicine. …a thoughtful and well-constructed manual to understanding and incorporating the complex and many-sided aspects of medication concepts into a coherent and logical informational framework. Drawing upon foundational data modeling and structured systems analysis techniques, the extensive use of graphical tools such as workflow, dataflow, and entity relationship diagrams to illustrate medication management processes provides the IT professional with a clear and accessible entry to this challenging topic. The chapter on medication prescribing is particularly illustrative of the author’s facility for deconstructing complex, intricate medication processes into their granular tasks and activities to show the key interactions and communications among patient, clinician and technologist. I believe both the experienced and novice healthcare informatics practitioner will find Dr. Scarlat’s book to be a welcome and essential addition their toolkit. With the incredible expansion of medication management information technology, both in the hospital and ambulatory environments, the need for a comprehensive reference text was essential. Dr. Scarlat's book fulfills that role and creates a space where clinicians and programmers can share a common knowledge platform to improve and advance the use of medication safety and efficiency in complex EHR systems. …a very useful guide to addressing not only the medication process but many service domains for practice, administration and patient-centered care in the community. The analysis and tools project a deeper understanding of how data are used by senders and receivers and how the capture and storage in appropriate data structures facilitate the data use for clinical decision support, health information exchange and future application with personal healthcare related to knowledge of genetic makeup to diagnose and treat. The critical process of structured system analysis (SSA) is necessary to inductively and deductively view the workflow processes from the point of view of many stakeholders. The SSA process guides open thinking and the data flow diagrams and entity relationship diagrams are types of tools to lead towards better application of data within events, thus better designs and better strategies to deliver care. Data workflow diagrams and the patient-centered process workflows require leveling from high level core practices to minute detail. This book provides the necessary detail that is often missing in many textbooks. Dr. Scarlat takes the medication process and its interactions between stakeholders (e.g., patient, physician) to detail the interconnectedness necessary for better use of data that goes into and is used from our electronic health records and health information exchanges. Many clinicians and professionals may not appreciate the detail that is necessary to make a better EHR that works for physicians, nurses and pharmacists to more effectively access and use the patient’s information efficiently. I particularly appreciate Dr. Scarlat’s message about the importance of data dictionaries for the clinician users within data workflow diagrams and entity relationship diagrams. I would agree this resource is to be used by both users and developers as a communication tool and knowledge database to clarify and define the context of terms during the system life cycle: analysis, design, code build, testing, implementation, training and maintenance. The figures and description to analyze the medication process generates thoughtful inclusion of detail such as indications, age bands, and ethnicity which are data components that will support better clinical decisions in the workflow. Genetic personalized healthcare will advance the clinical decisions related to best treatment plan, therefore our EHR systems should continuously evolve to support clinicians by handling the complexity of knowledge and patient information that must be present to make decisions related to age, gender, conditions and genetic makeup. Dr. Scarlat’s Electronic Health Record: A Systems Analysis of Medications Domain is very useful in health informatics education at university and the HITECH courses within community colleges as well as for any programmers and managers responsible for system analysis and improvements in the design and application of data use. 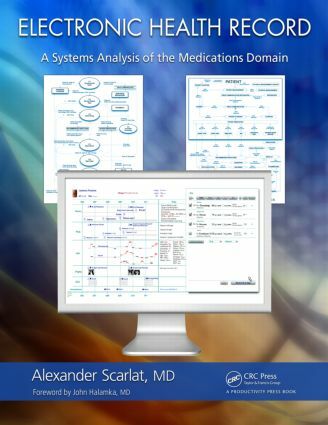 Dr. Alexander Scarlat’s Electronic Health Record: a Systems Analysis of the Medications Domain is a welcome and valuable addition to the toolkit for IT professionals and clinicians participating in the design or implementation of EHR systems. As an RN in the healthcare IT field, I appreciate the importance of understanding clinician workflow and the desired future state, particularly in the medication process. Having taught a graduate level overview of information systems class as well, I also understand the challenges some students experience when learning to create entity-relationship diagrams and data flow diagrams. Dr. Scarlat’s easy-to-understand explanations are the most detailed I have seen. This book will be indispensable to students learning system analysis and a valuable adjunct to current professionals as they attempt to represent data and its flow through the EHR system. Since so many of the Stage 1 Meaningful Use objectives pertain to medications (use of CPOE for medication orders, drug-drug and drug-allergy checks, e-prescribing, active medication list, active medication allergy list, clinical decision support rule, drug formulary checks, and medication reconciliation), Dr. Scarlat’s book is especially timely. What is the ideal medication workflow? Simple – from doctor’s brain to patient’s vein without handwriting, handoffs, or hassle. Dr. Scarlat’s clear explanations empower healthcare professionals with tools that will enhance any IT project … it provides a framework that will enable clinicians to communicate with technologist. I plan to use this book in the BIDMC medication work, which seeks to achieve zero defects, cost reductions, and patient engagement. Both clinicians and IT professionals should find the book to be a valuable resource as they create the reformed healthcare delivery system of the future, beyond Meaningful Use. Trends Are Nice, but Where Are the Numbers? Alexander Scarlat, MD is board certified in Anesthesiology. He has practiced medicine for 18 years and holds a degree in Computer Sciences. Dr. Scarlat has a strong background in healthcare informatics, working for more than two decades with vendors in electronic health records R&D and with hospitals implementing healthcare information technology. Fluent in both medical and IT languages, he is a knowledgeable and experienced liaison between clinicians and IT specialists.